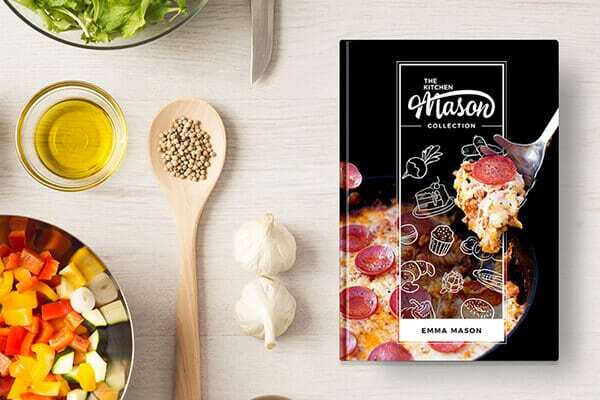 Looking for an insanely simple and easy party food idea for your seasonal celebrations? 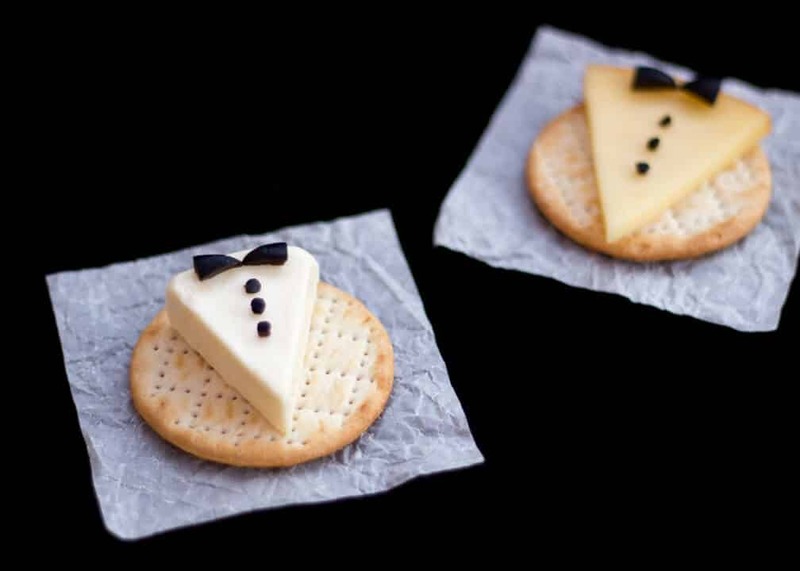 Look no further, I’ve got you covered with these super cute & stylish Tuxedo Cheese & Crackers! How amazing do they look?! Here is what you will need to make these little beauties. Firstly, cut the hard cheese into triangles or peel the wrappers off the soft cheese triangles. Then you just need to sit down at a table with a chopping board, the olives, the items listed in ‘Essential Equipment’ and start carving! 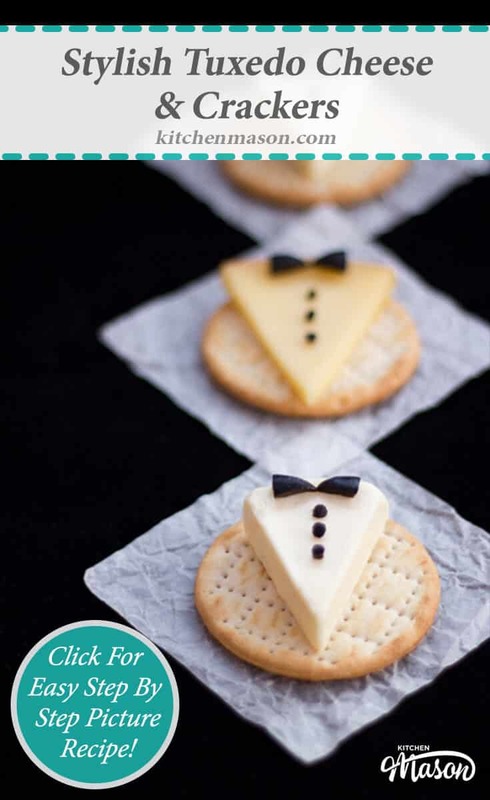 Either using a sharp knife (I used a vegetable carving knife) or some scissors, cut out little triangles to use for the bow ties. I found it easiest to cut each olive into quarters and flatten them first. 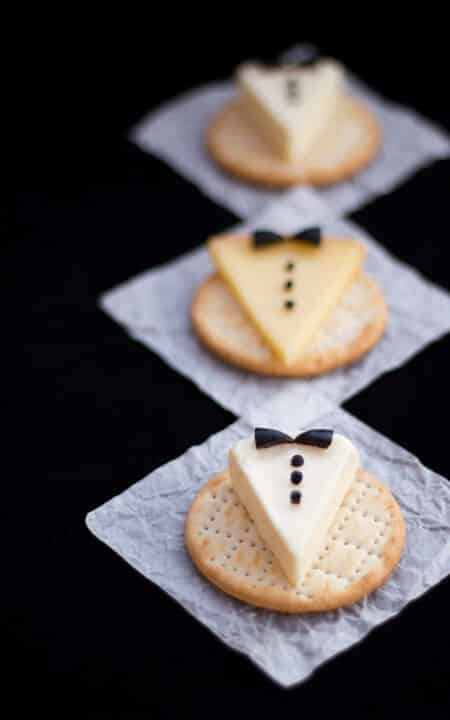 Then place the bow ties and buttons on each piece of cheese and serve on crackers to your happy guests! 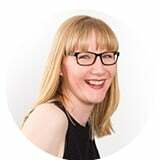 Ok, so they may be a bit fiddly & time consuming but look how cute they are!! At least you can sit down at a table and do the fiddly bit so you’re not on your feet for ages – definitely a winning point for me in my whale like state! It’s worth the effort just to get great comments from your guests I think. 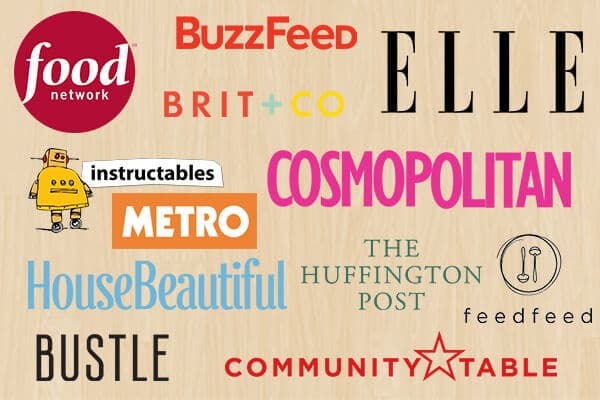 And let’s be honest – you are definitely going to get great comments about these! They really stand out and look super smart for a celebration or party buffet table. A spectacular addition to help see in the new year. And on that note, I hope you enjoyed the post you fabulous fabulous people! I wish you all a very happy & prosperous New Year. When I first looked at these, I thought the buttons were peppercorns. They would work, too and be a bit less to fuss with. Very true, that’s a great idea! What a great idea! And so easy to make too!! They are just too cute to eat!! such a cute idea! Will definitely try! !